We created a downloadable version of the poem, download it here. 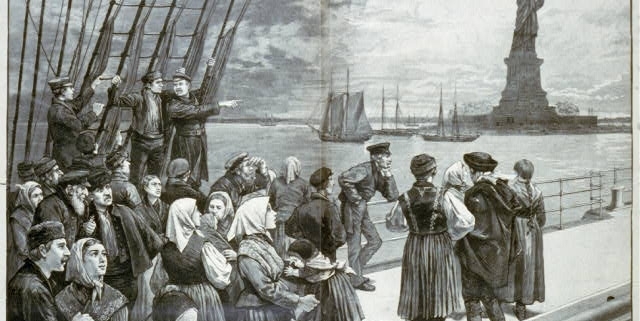 “Give me your tired, your poor, your huddled masses yearning to breathe free,” proclaims the Mother of Exiles, in words that reverberate today as a definition of what America offers to the world. The poem was written by the American-Jewish poet Emma Lazarus, as a donation to an auction of art and literary works intended to raise money to build a pedestal for the colossal statue just given by France to the United States—“Of Liberty Enlightening the World,” as the Statue of Liberty was originally named. 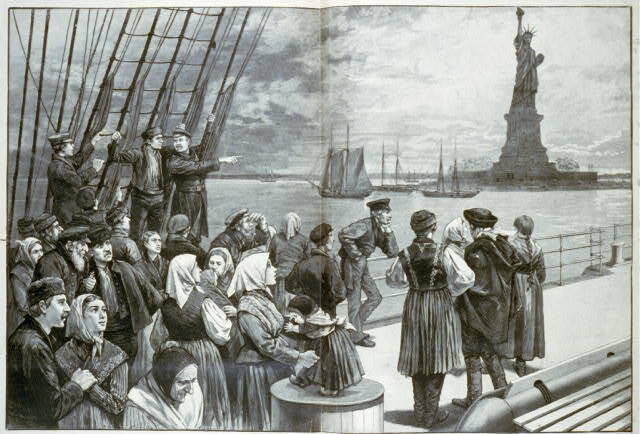 Initially, Lazarus was not interested in contributing a poem, but a friend convinced her that the statue would be of great significance to immigrants sailing into the harbor. This was a crucial, new idea. The statue was originally intended as a monument to international republicanism and friendship between the United States and France. 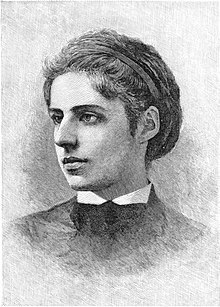 But Emma Lazarus, in the 1880s, was deeply engaged in advocating for the flood of destitute Jewish immigrants fleeing anti-Semitic violence in Russia and throughout Eastern Europe, and so she wrote a poem that succeeded, surely beyond her wildest dreams, in changing the meaning of the statue and the meaning of the United States of America. “The New Colossus” was the only entry read at the exhibits opening but was forgotten and played no role at the opening of the statue in 1886. Lazarus died young, in 1887, of cancer. But in 1903, a plaque bearing the text of the poem was mounted on the inner wall of the statue’s pedestal. You can read it there today. It is an amazing poem. It claims that we represent not war and conquest but freedom, enlightenment, and compassion. The brazen giant of Greek fame was the Colossus of Rhodes, once one of the Seven Wonders of the World. A monument to military might. Instead of warrior-like pride, here is a mighty woman whose torch is imprisoned lighting, a beautiful phrase implying technological innovation. I’m thinking of Benjamin Franklin’s experiments with electricity here. Naming this woman “Mother of Exiles,” calling her eyes “mild yet commanding,” and announcing that she stands for “worldwide welcome” is a stroke of radical insight into what America was and could become. And the words Lazarus has this figure cry “with silent lips” still bring tears to my own eyes, tears of admiration and gratitude. For me, this poem’s beauty cannot be separated from my family’s history. All my grandparents came to this country in the 1880s, at just the moment that inspired the poem. They were escaping poverty and pogroms. To them as Jews, America was the land of opportunity, of hope for the hopeless. None of them ever became rich, but they survived. For them the rejection of the old world of monarchy, aristocracy, tyranny, and the dream of a new world of freedom and safety, came true. I was taught this dream by my parents, taught that I should be proud of being American, not because we were “the greatest,” whatever that means, but because we were the melting pot. We were a democracy that gave hope to the little people. We were a land of refuge. We were the land where prejudice and hatred might one day be eliminated. Millions and millions of American families coming from every corner of the globe have experienced that hope. Of course, there exist Americans whose own families came here as immigrants and have reaped the benefit of that lamp lifted beside the golden door, who now wish to deny the chance of others to breathe free. But we do have a choice. We can keep the gates open. We can choose generosity, compassion, and openness to the strangers in our midst, rather than self-protection and fear. As an American poet, I’ve written about my immigrant grandparents and second generation parents and their struggles. I belong to a tradition of openness that includes Walt Whitman, who celebrated America’s variousness, and in my own time I have had the good fortune to be the countrywoman of William Carlos Williams, Muriel Rukeyser, Denise Levertov, Allen Ginsberg, Silvia Plath, Galway Kinnell, Paul Muldoon, Lorna Dee Cervantes, Naomi Shihab Nye, and Li-Young Lee, to name only a few. All deeply American. All immigrants or children of immigrants. I am proud that American poetry is becoming more open in our time to writers of every background and that American culture altogether is a hybrid phenomenon. For while we are remembering how much America has meant to its immigrants, let’s remember also what the talent of its immigrants, the talent and energy of its immigrants, has done for America. Our art, our music, our fiction, our movies, our science and technology, our leadership is a magnificent mix of ethnicities. Native-born and immigrants breathing free, bouncing off each other, making America the cultural wonder of the world. May we remain so. May the mean spirited among us slink back to their corners. May the Mother of Exiles prevail. For more on the link between The New Colossus and the Statue of Liberty follow this link.